Two weekends ago, I participated in the Great American Bake Sale to raise money for Share Our Strength. I was partly excited because it meant testing out my Pig Candy cookies on the public (and Mrs. Rhonda Kave), but the greater part of me was excited to have a reason to go to the Ft. Greene Brooklyn Flea! Always such good eats there! 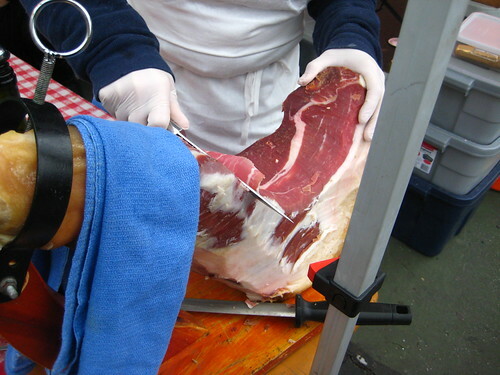 I knew Salvatore Bklyn sold their ricotta cheese, olive oil, and cannolis at the Fleas, but I was not aware of the on-site carving of prosciutto! I eyed the leg on my way in, knowing that their baguette was going to be a mid-day snack! 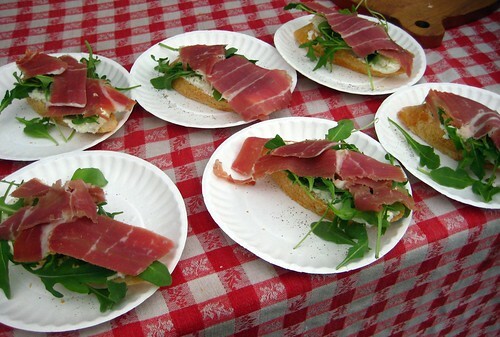 For $3, you get a crunchy baguette smeared with their ricotta, a covering of arugula, topped with a fresh slice, and then drizzled with olive oil-the perfect little Italian snack for shopping. I did have a little sweet treat from the bake sale before leaving, one of the Bacon Macarons from Macaron Parlour. Between the bacon cookies lay some maple cream cheese frosting with a bite of candied bacon, the best brunch sweet I could ever have. It was truly delicious, and I can't wait to hunt them done to try out their other flavors. 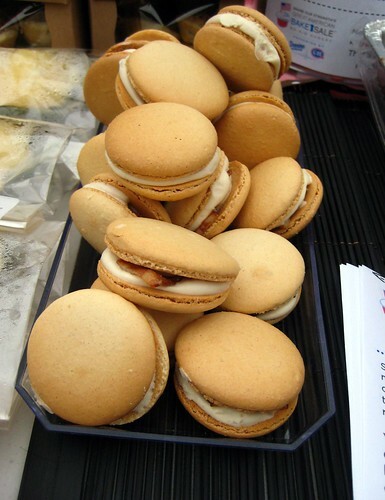 They are currently selling lemonade at the Hester Street Fair, but hopefully they'll add some macarons to the table! Salvatore Bklyn cheese is available at select stores in Brooklyn. Check out their website, www.salvatorebklyn.com, for more information.